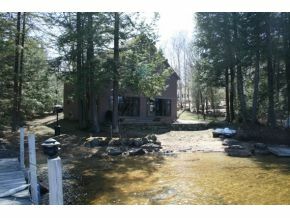 Bow Lake home with a level walk-in sandy beach. Bow Lake is over 110o acres. It is one of the cleanest and clearest lakes in NH. This home has many upgrades throughout- hickory wood flooring in Kitchen and Dining area, new cabinets in kitchen and baths- too much to list. This is a must see and won't last. 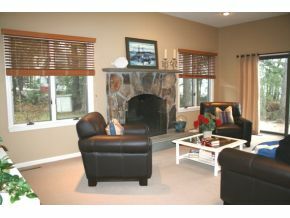 It has a walk-in sandy beach with a level lot and gentle sloping waters with a beautiful view. Summer or Full time living equals relaxation and fun. Listed by Virtual Homes, Inc. This 6 room, 2 bathroom, 3 bedroom home has privacy. Sit in the great room with 10 foot ceilings and enjoy watching the glow from the fireplace on a cool spring evening. This home is a short drive to Concord or Portsmouth NH and has some of the best rainbow trout and brown trout fishing around. Get out on your boat for some water skiing in the summer or hop on your snowmobile in the winter. This is a year round home with lots to offer. Almost forgot the permanent dock to hold your jet ski or fishing boat.